Posted by elzilcho in Musical Performances, Public event, Tibetan art, Tibetan Arts and Culture, Tibetan Food, Uncategorized. 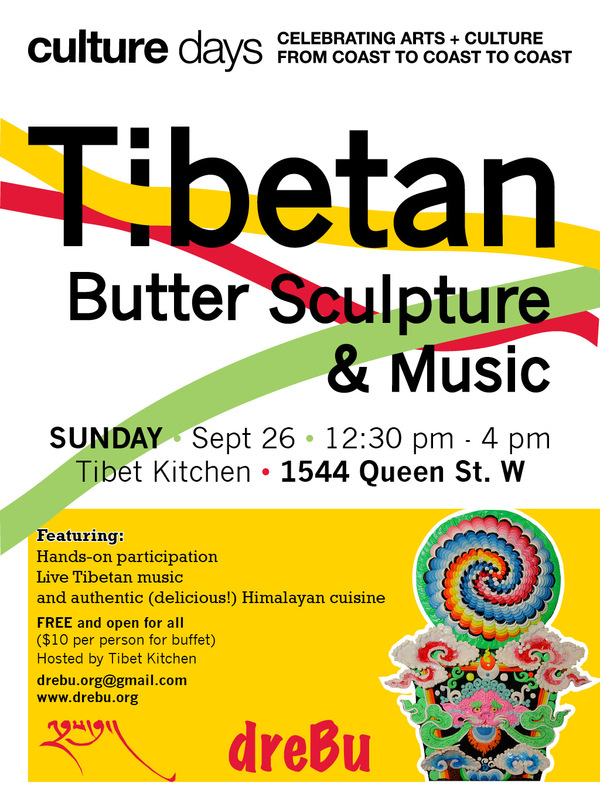 dreBu is proud to celebrate Ontario’s first Culture Day Weekend by presenting the ancient art of Tibetan butter sculpture. Live demonstration by artists, including hands-on activities for aspiring butter sculptors. Also featuring a live performance by accomplished Tibetan musician, Tseten. The event will be capped off by a sumptuous offering of authentic Himalayan cuisine by the most popular Tibetan restaurant in town, Tibet Kitchen. The event is free and open for everyone. The buffet is $10 per person. Please bring along your whole family for a fun and delicious Sunday afternoon.